This is a series focused on personal journey with eczema while managing a certain aspect of life. Today, we have Stephanie, whose daughter has eczema since 18-month old and shares how she manages wet wrapping for her. Stephanie is the founder of Allerchic, an online store for eczema, allergy and asthma. Marcie Mom: Hi Stephanie, thanks for taking part in my Friday blog series ‘Someone has Eczema’! Let’s start with you sharing your family eczema history, who has eczema and what’s the level of severity for your daughter? Sadly the eczema comes from my side of the family, I had eczema as a child not what I would class severe, more the typical spots you expect, backs of knees, elbow creases. It disappeared for a long time then came back in my 30s on my eyelids. My beautiful girl Jade has the triple threat of atopic conditions she has anaphylaxis, asthma & moderate to severe eczema. Marcie Mom: I understand that you believe that wet wraps had helped improve your daughter’s eczema. How did you discover wet wrapping, and what improvement to your daughter’s skin did you notice? Stephanie: Wet Wrapping has made a Huge difference to my daughters eczema! I first discovered Wet Wrapping when working in Children’s Ward (almost 20yrs ago), thankfully things have changed a lot since then – there is no more wresting a small child while trying to wrap bandages! For my daughter the Wet Wraps have an overnight effect on her eczema. The next morning without a doubt we see improvement, It may still take a couple of nights to get a flare up under control, but it is definitely quicker than cream application alone. Marcie Mom: Quality of life is a big issue for eczema families. What do you think about your quality of life and your daughter’s before and after wet wrapping? Stephanie: Before I started Wet Wrapping during a flare up neither of us had a great quality of life (or sleep!). Jade was often crying during cream applications, she was itchy, hot & irritated during the night & although fast asleep I knew she wasn’t getting the deep restful sleep needed as she was so agitated all night. This then of course flows over into the day, Lack of concentration, irritability & of course constant irrepressible scratching was sending us both crazy. As a mother it breaks your heart to see your child like this, so of course I had to find better way. Wet Wrapping took the sting out of cream application, they take the heat of the rash & seem to generally make her a lot more settled & calm & as we apply her wet wraps before bed they without a doubt have improved her quality of sleep too. So once again this flows into the day. Now I have a much happier, less itchy & irritable little girl. And a happy eczema child = a very happy mummy! Marcie Mom: One final question – did you daughter take well to her first wet wrap? Any tricks you used? Stephanie: The first time I applied the Wet Wraps she was very miserable & irritated but it was almost like someone had waved a magic wand & she calmed very quickly once they were in place. 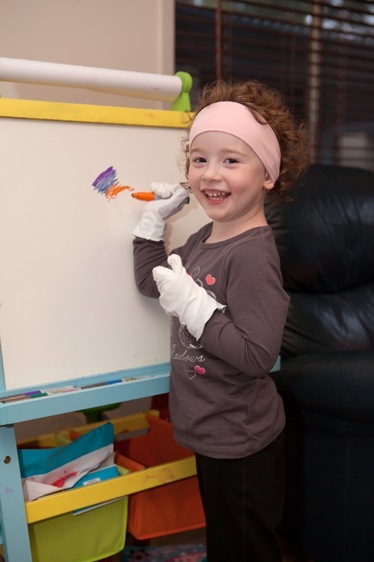 Because we started using Wet Wraps fairly early on my daughter she is happy with the process, she knows it makes her feel better & so she is happy to wear them. Watch the Youtube Video on how to Wet wrap, do this a couple of times until you feel comfortable with the process. Have EVERYTHING ready to go before you even bath your child – This includes thinking about where you are going to apply Wet wraps, for little ones also think about a song you can sing or put their favorite movie on to help keep them distracted. Explain to your child that it will feel a little funny at first, but it will stop them feeling so itchy. For Babies feed them straight after Wet Wrapping (Breast or bottle) to help them settle, For older children a reward such as a game on the ipod, a special story & cuddles are a great idea. I truly believe, It is so important to set up positive reinforcement around Wet wrapping. For Parents – Don’t stress or beat yourself up about getting the technique perfect. You will figure out the best routine for you & your child! Marcie Mom: Thanks Stephanie for taking time to share your wet wrapping journey, indeed many have positive feedback on it. Stephanie: Thank You Marcie Mom its been Great Talking with you!